The Pheasant in High Wycombe is a friendly, family run pub. The pub is close to train station and town centre, also right opposite is The Rye. 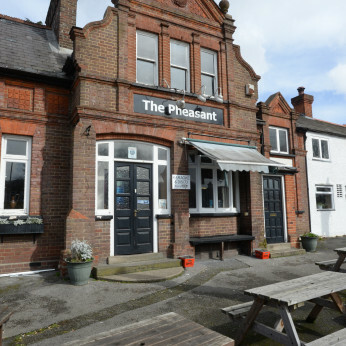 The Pheasant is a warm, welcoming, family pub with beer garden,and children's slide, trampoline etc. We have a dart team that play on a Wednesday evening and a pool team that play on a Thursday evening. We have started a pub quiz every other Friday which starts at 8pm. Mondays: We have FREE pool. Tuesdays: Buy 2 pints get the 3rd HALF price from 6-9pm. Thursdays: Buy 8 pints get the 9th FREE (Bring your card back every Thursday) from 6-9pm. Fridays: Double up for £1.50 on spirits. Come in before or on the night to place your bets. 1st race starts at 8om all bets must be placed before 1st race starts. Come and join us for lots of fun raising money for cancer. All money raised to go to the Florence nightingale hospice and Macmillan. Come in an hour before kick off, pick a card with every drink purchased until kick off. If you pick a yellow card and a yellow card is shown in that match, you will get one free drink. Pick a red and if a red card is shown you will receive two free drinks ! !